In the 1960s, Herman Rothstein started selling candy out of his car. Within six years, his business outgrew his car, moved into a warehouse, and transformed into the candy distribution company, Redstone Foods. Today, the Carrollton-based company supplies shops all over world with more than 6,000 types of chocolate, specialty candies, bottled soda, and other novelties aimed directly at the sweet tooth. 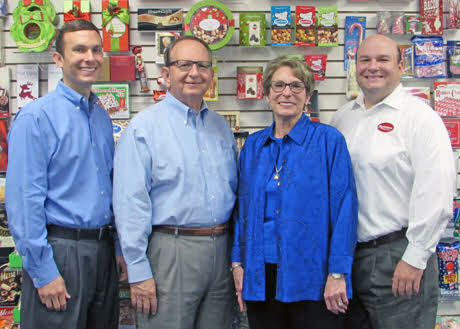 Herman’s son Stan, his wife Marilyn, and sons Josh and Neal run the company, which has steadily built a loyal customer base thanks to its commitment to offering a variety of unusual products and quality customer service. As the business has grown, so has competition. For that reason, Redstone Foods has focused on improving online customer service through its website. “That’s been a strategic priority for us over the last five years,” Neal Rothstein said. Redstone also recognizes that responsiveness is a differentiator in a global market, so the company ships within 24 to 48 hours of receiving an order, and has built a dedicated sales team to ensure customers receive exceptional service. “Our customers typically are in high-rent locations, and they need to find products constantly that are unique and different from the mass market, where they can make their full margin, and have something compelling for their customers to come in and draw them into their stores,” Neal Rothstein said. Redstone Foods’ rich history helps the business attract unique and appealing offerings that keep the business — and its customers — ahead of the competition. “With our history, particularly with Stan’s longevity and (relationships within) the industry, we’re able to find new and innovative products,” Neal Rothstein said. Redstone Foods also has maintained its nimble response to market demands, so that it can bring new products to customers as quickly as possible. Another key to Redstone Foods’ success is its location. “We’re about equidistant from either coast, and we’re not the exact geographic middle of the country, but we’re close to it and we’re on main transportation routes. It’s really been very effective in terms of giving us exposure all over the country,” Stan Rothstein said. Since Dallas Fort Worth International Airport is a major hub, it’s easier for customers and vendors to visit the showroom, he said. “Our offshore customers have gained in importance with us more and more over the years. You can fly into Dallas from just about any place in Europe or Asia now, Latin America, and so forth,” Stan Rothstein said. But the foundation of Redstone Foods is the strength of its team. “We’re more than a website. We’ve got a great service team who really can act as consultants for our customers, to help them with their product selection and grow their businesses,” Neal Rothstein said. The BBVA Compass Success Series highlights home-grown, innovative businesses in the North Texas region who are also BBVA Compass clients. BBVA Compass operates 674 branches, including 345 in Texas, 89 in Alabama, 75 in Arizona, 62 in California, 45 in Florida, 38 in Colorado and 20 in New Mexico. BBVA Compass was recently named Best Digital Bank in North America by global finance magazine Euromoney and the best regional bank in the South and West, as well as earning best mobile app, in Money magazine’s annual list of the Best Banks in America.